The name taekwondo was adopted in 1995 at a conference of kwan masters, historians, and taekyon promoters. The name was coined and formally suggested by General Hi and when the Korean Taekwondo Association (KTA) was formed in 1961, General Hi was elected as its first president. Jill Konopacky is the advisor of the Stevens Point Area Senior High (SPASH) Taekwondo club. She is a 5th-degree black belt and she has been practicing Taekwondo for 18 years. What is taekwondo, is there a deeper meaning to it than just kicking? It’s an art, some people consider it to be an art form and some people consider it a way of life. It is a mindset as well…there are the five basic tenets: courtesy, integrity, perseverance, self-control and indomitable spirit. That’s the five. What is the history of taekwondo and how it came to be what it is today? We had to actually learn the history of taekwondo for our second-degree black belts. I’m really bad with memorizing facts, but I can tell you that it had its roots in China and it was an actual martial art. There was a period of these warriors who were young, aristocratic young men. They came from royalty and they trained really hard to know taekwondo. What are the levels in taekwondo and how long does it usually takes to reach each level? We have the color belts: white, yellow, green, blue, red and then you can test for black belt and each one of those has two levels. We say white and then we say high white after you test the first time and yellow then high yellow and green then high green. Generally, like if you were to take classes, say from Master Johnson on Isadore Street, it’s a minimum of two months between testing so if you work really hard and really know your stuff, you’d be able to test every two months…so to get to black belt, typically on the faster end would be about two years. Then once you’re on the black belts, the time in between gets farther and farther apart so when you’re a second-degree black belt, you have to wait for two years before you can test again. When you’re a third-degree black belt, you have to wait for three years before you can test again. What’s the highest degree in taekwondo? The highest is the 10th degree. I don’t know anybody who’s a 10th degree. I think in the United States, our highest is 8th degree. The highest that anybody has achieved. Here in town, we have quite a few who have reached 7th degree which is quite an honor. In fact, we have a family of four that just tested together, which is really cool…they all tested and they all passed. Once you get to a higher rate, you have to be of a certain age too so these are two parents and two adult sons. So then at what age do you have to be for a black belt? You can get a black belt if you’re under 18, it’s called a Poom and then when you turn 18, they turn into Dans. So I don’t remember for sure, but I think its fourth degree where you have to start waiting until you’re a certain age before you can actually reach that. What got you into taekwondo? I actually took a class at the YMCA, a kickboxing class because I wanted to get in shape and I walked pass the taekwondo class on my way out every night and so I thought that that was really cool. So I was 40 years old when I started and then my daughter started in the next session. We went together, we went through 3rd-degree black belt, we did it together which is really neat and now her children are going to be starting soon. How hard was it for you when you first started and what advice do you have for beginners? It was really hard when I started. The class I started was really big and I had a hard time hearing the instructors and I would just try to follow along and I felt really klutzy and really stupid, but I preserved, perseverance is one of those five basic tenets, and I just kept at it and I got a lot better. And then I was studying it so much because I was taking a university class and I was taking it at the YMCA and I was teaching for Master Johnson on Isadore so I would be like six hours a week, I would be learning or teaching it. I was a part-time university student at the time so I had the time to devote to it. So my advice would be if you’re going to do it, to try to get there all the time and practice as much as you can. What is something that you like about taekwondo and what’s something that you don’t? I really like the people who are involved in it, both in the club here and the other schools I belong to. You get, really, a community of people working towards the same goal. One thing I don’t like is, I’m not fond of testing. I don’t like getting in front of a bunch of people to show what I’m doing and especially giving speeches. I’m not a speech person. Was there a reason why you started a taekwondo club at SPASH? I was advisor for SADD at the time and I actually got paid for a little bit, but it wasn’t something that was my personal interest and so taekwondo was a personal interest of mine and I saw that there were a lot of people who were active in taekwondo in the school and I just thought it would be a lot of fun. What did you hope to accomplish through the club? I wanted to have a lot of fun. I also wanted to give these high school students a chance to work out at their level. 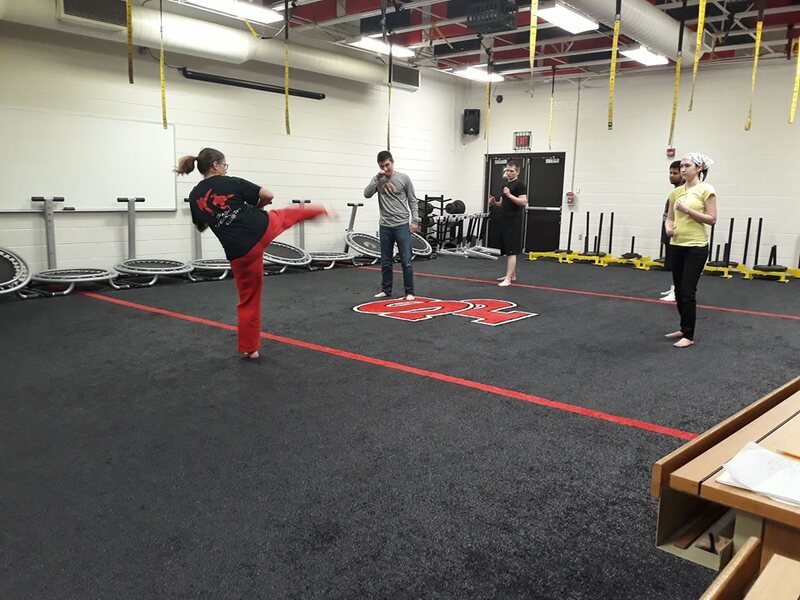 Once you’re a black belt, at the school you always have to teach so this would give them a chance to work out and enjoy themselves, practicing it rather than just teaching all the time. What hopes do you have for the club in the future? I hope that our membership stays as strong and diverse as it is and that we continue to improve our club.